Deutsche Bank maintains its bullish stance on gold, in spite of missing their aggressive projection a few weeks ago (see discussion). 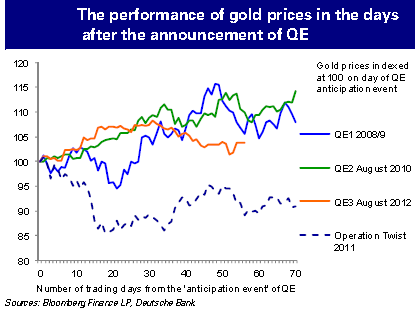 Gold has underperformed the previous post-QE price moves, as shown in the chart below. Part of the difference in this monetary expansion cycle from the previous ones is that the new program is having a fairly slow start in terms of its impact on base money. As shown in the chart above, Operation Twist for example had little effect on gold prices because it didn't involve increasing the monetary base (what some refer to as "money printing"). For every dollar in securities bought, there was roughly the same amount of securities sold, keeping base money from rising. Bank reserves, which is the primary mechanism for impacting base money, actually declined over the period since the Twist program was started (chart below). 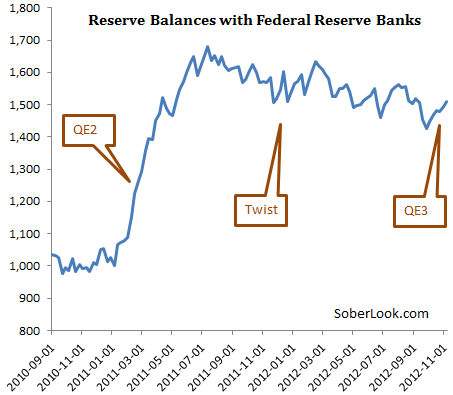 And the recent asset purchase initiative (QE3) has barely moved the reserve balances so far. Once the latest program begins to ramp up and bank reserves start growing again, real interest rates should move deeper into negative territory (see discussion) and the dollar should weaken (see discussion). That is likely to create a fairly bullish environment for gold. According to DB, the US fiscal uncertainty and potential risks of another debt downgrade will also support that market. DB: - ... during the remainder of this year we expect the US fiscal cliff and further efforts by the Fed to extend QE will not only push long term real interest rates deeper into negative territory, but, also resume US dollar weakness. Moreover any speculation of an additional downgrade in US Treasury debt would be supportive to gold prices, in our view.